Gorkha Janmukti Morcha president Bimal Gurung today accused chief minister Mamata Banerjee of disrespecting Nepali poet Bhanu Bhakta Acharya - who is epitomised by the Nepali community for his contribution in uniting the Gorkhas - by announcing the formation of new community development boards during Wednesday’s programme to mark the bard’s 202nd birth anniversary. 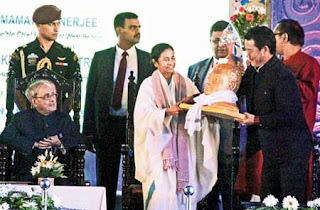 Gurung made public his displeasure during the annual general meeting of the Darjeeling Tea Association where President Pranab Mukherjee and West Bengal Governor Keshari Nath Tripathi were present as special invitees. The GJM president, who attended the DTA AGM in the capacity of Gorkhaland Territorial Administration chief executive, said the chief minister had acted in contrary to what Bhanu Bhakta had aspired for. “Not a single person from our community was allowed to speak in yesterday’s programme to mark the birth anniversary of the great poet and this has hurt me deeply. I too was not called upon to speak although I was present as a special guest,” Gurung said while thanking the DTA for giving him an opportunity today. “It is sad that the chief minister chose to announce the formation of new boards and create division during a programme honouring Bhanu Bhakta Acharya. I received hundreds of calls from people saying this was not right,” he lamented. Gurung started his speech in Hindi but changed to Nepali when he made the allegation at the chief minister even as state tourism minister Gautam Deb listened on. “On Wednesday morning, we met the CM to create a cordial atmosphere. But we did not have any inkling that she would announce boards for the Kami, Damai and Sarki communities. Had I known about it, I would have left the programme half way,” the GJM president said. Gurung said that on Wednesday, the chief minister was requested to declare July 13, the birth day of Bhanu Bhakta, and Buddha Purnima, state holidays, which was turned down. Looking towards President Mukherjee, the GTA chief executive interpreted the announcement of development boards as interference by the state government on the autonomy of the council and requested his intervention. “The GTA and its chief executive have the assent of the President of the country. We too want the council to function. But such interference belittles the importance of the council body and under such circumstances, I request the President and also the Governor to take this issue seriously and intervene, or else scrap the GTA for good,” Gurung said. President Mukherjee reiterated his appreciation at the chief minister’s effort to assimilate the various ethnical and cultural groups of the region under the GTA for their development. “The chief minister is making a serious effort to resolve the problems of the tribal and cultural groups. That is why the GTA Act was passed and the authority created to be in charge of the administration and take responsibility of development. I wish them all success,” he said. Talking to reporters afterwards, Gurung said he was not against development boards, which actually should have been kept under the GTA, but claimed they were benefiting only a few people. “The development boards are not helping the masses but only a section of select people. There is rampant corruption,” he alleged. In the evening, a seven-member GJM delegation led by party general secretary Roshan Giri called on the President at Raj Bhawan and submitted a memorandum of demands. “We placed several issues relating to the GTA before the President. We also told him that either the GTA be handed full powers or a separate state be given,” he claimed after coming out from Raj Bhawan.